Lovely two bedroom villa on a hilltop in Naxos. Great welcome and very helpful staff. It is peaceful with a lovely view from the outside of the villa, a beautiful large pool and a 10-15 minute drive to the port and centre of Naxos. Great for a family with a car to explore the island. Had a fabulous 4 days at Belogne Ikons with my family. The resort was away from the crowds but close enough to the beach to pop in and out when needed. Being up in the hills the views were spectacular and the surrounds were quiet. Plenty of great taverns close by to experience real Greek food. 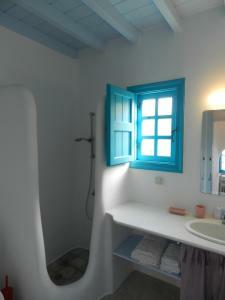 The bedrooms were spacious, the kitchen was modern and clean and came with a great welcome pack. The pool was fabulous and the hosts were really friendly and helpful I would thoroughly recommend a stay at Belogna Ikons. La piscine, la déco, l'espace, l'architecture traditionnelle, le service hôtelier, la terrasse. וילה מדהימה ביופיה. חלק ממתחם וילות מקסים. בריכה מצויינת אבל המון צרעות כך שחויית הרחצה לא משהו. L'accueil de notre hôte qui nous a rempli le frigo pour notre arrivée et nous a amené un matin des beignets pour le petit déjeuner. La piscine était très agréable et la vue splendide. Aménagement intérieur très soigné, très belle vue, piscine très agréable. Très bon accueil. Localisation très pratique pour visiter les villages et accéder aux plages de l’ouest de l’ile. BELOGNA est à 10 mn du port .. bungalows très propre avec vue top sur naxos town de la terrasse . pour nous , c la 2eme fois , c pas pour rien , c est assez central pour bouger, les plages de mikri ou glyfada , les villages d halki ou de koronos , le port et le temple d appolon , et le village tres local de vivlos à 2 mn . tout assez accessible en voiture évidemment . Lock in a great price for Belogna Ikons – rated 9.6 by recent guests! Boasting authentic Cycladic architecture and tasteful modern design, Belogna Ikons are built next to the Tower of Belogna, in Naxos. The complex offers an impressive swimming pool with 3 showers and changing rooms. 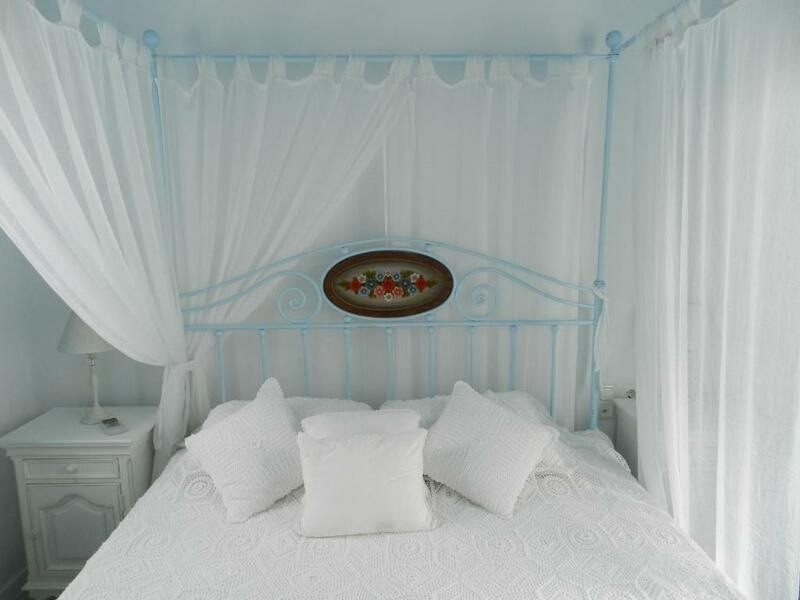 The peaceful accommodations, in complete harmony with the natural beauty of the surrounding area, offer discreet luxury in a hospitable setting. The uniquely designed villas, built up on a slope, offer private external space, including a private parking area and unobstructed views of the Aegean Sea. The tasteful interiors offer a fully equipped kitchen with everything necessary from a microwave oven to a cappuccino machine. Upon request guests can have their own private cook who will take care of the preparation of their meals during their stay. The housekeepers, responsible for the care of the villas, are ready to assist guests with anything they may ask. Modern installations include satellite TV and wireless internet. 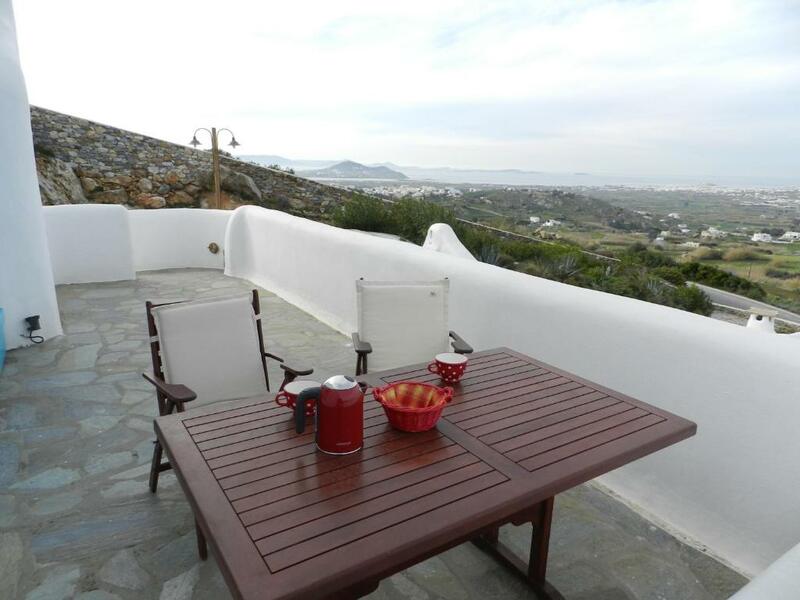 This property also has one of the top-rated locations in Vívlos! Guests are happier about it compared to other properties in the area. 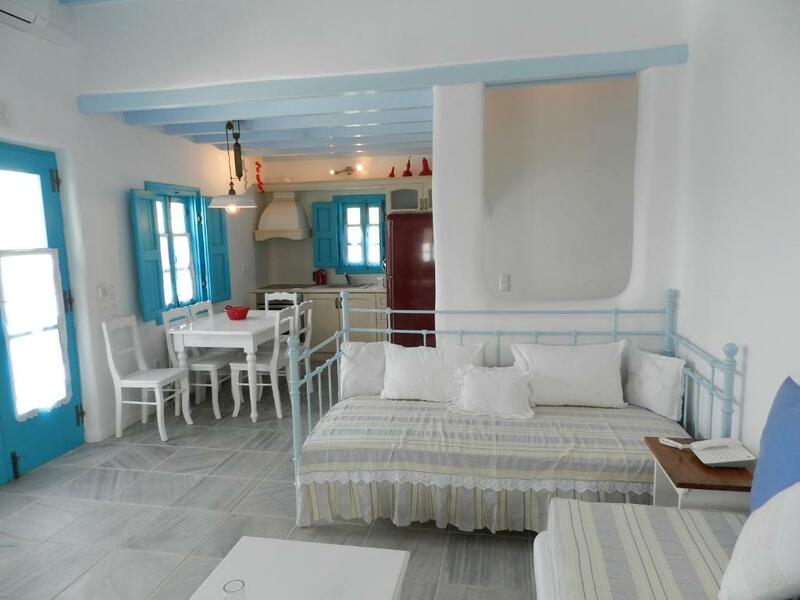 This property is also rated for the best value in Vívlos! Guests are getting more for their money when compared to other properties in this city. When would you like to stay at Belogna Ikons? The uniquely designed villas, built up on a slope, offer private external space, including a private parking area and unobstructed views to the Aegean Sea. The tasteful interiors offer a fully equipped kitchen with everything necessary from a microwave oven to a cappuccino machine. The uniquely designed suites, built up on a slope, offer private external space, including a private parking area and unobstructed views to the Aegean Sea. The tasteful interiors offer a fully equipped kitchen with everything necessary from a microwave oven to a cappuccino machine. These villas are located on a hillside. 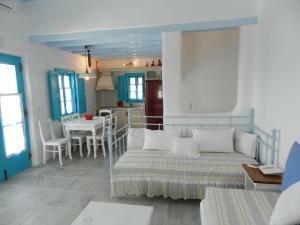 They are tastefully furnished with a fully equipped kitchen and enjoy unlimited views of the Aegean Sea. Free private parking space is provided. 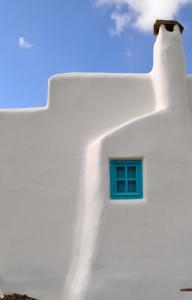 Belogna ikons complex is emblematic of the entire Cycladic architecture. Belogna ikons was designed, constructed and equipped based on the upbringing, real-life experiences, knowledge and dreams of people who love and appreciate the traditional ways of Naxos. Their principal aim was to bypass the often casual attitude towards tradition that can lead to architectural tastelessness or to a lack of harmony with the surrounding natural environment. 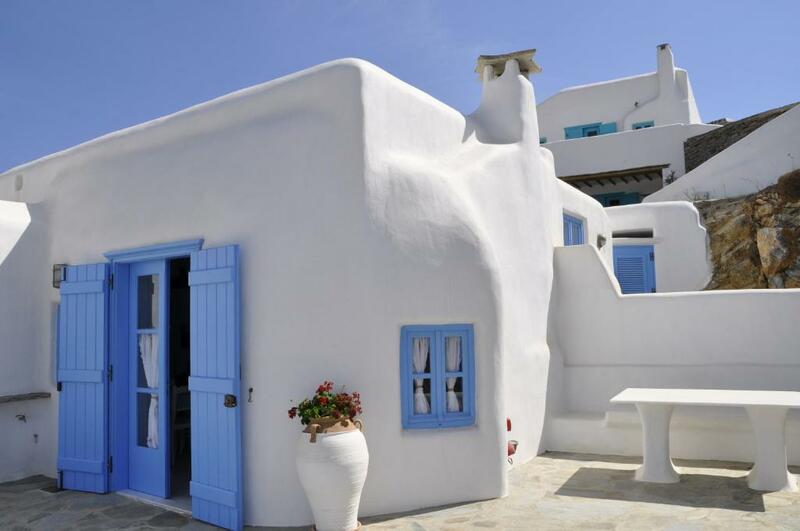 Belogna ikons is meant for those who are familiar with the authentic Cycladic islands, especially Naxos, and for those who wish to discover that authenticity in a peaceful location with panoramic views. The location was not picked arbitrarily; the complex is built next to the Tower of Belogna, a landmark of Naxos, a symbol of tradition and an emblem of savor. Belogna ikons, bowing to the magnitude of the Tower, dares the comparison seeking to fit next to the Tower without offending it. Belogna ikons allows you to gaze at Naxos and its capital, without depriving you from the proximity to the water – large swimming pool instead of personal bath tab-type pools, easy access to the beaches – and a comfortable accommodation. 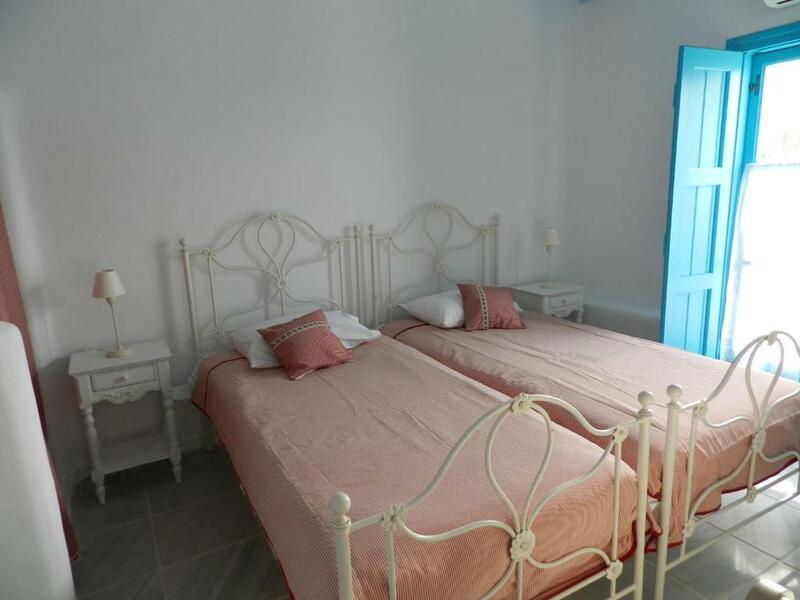 We are at a nodal, although very quiet and discreet, point of the islands main road arteries leading to the major sand beaches of Naxos island and the hinterland villages. Northern west beaches like Agios Prokopios, Agia Anna, and Plaka are 4-5 km from the villas location. You have to cover the same distance to these beaches if you stay in Chora (naxos town). We are half distance (compared to Naxos town or other locations like Stelida, Agios Prokopios, etc) from the southern west beaches like Kastraki, Vigla and Pyrgaki (10-15 minutes drive). Belogna ikons is also very near to archeological sites like Belogna Tower, Temple of Dimitra (gyroylas), Yria etc. House Rules Belogna Ikons takes special requests – add in the next step! Belogna Ikons accepts these cards and reserves the right to temporarily hold an amount prior to arrival. Shuttle services from the port and the airport can be arranged upon request. Kindly inform the hotel in advance. Please inform Belogna Ikons of your expected arrival time in advance. You can use the Special Requests box when booking, or contact the property directly using the contact details in your confirmation. 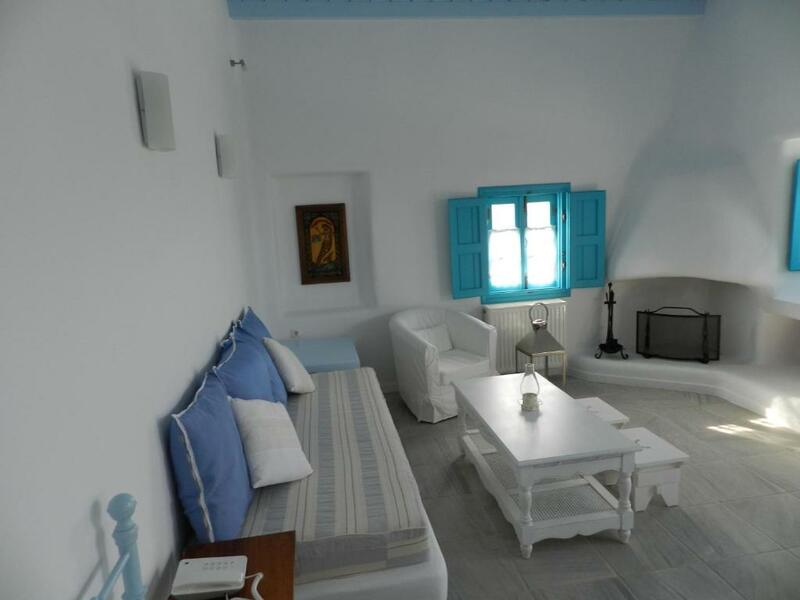 This place is a real gem, not typical of affordable Greek accommodation. It’s quiet, located on a hill with breath taking views and a constant breeze which keeps the mosquitoes away and keeps it pleasant despite the heat. You do need a car but you’d probably have one anyone so you can tour the island and various beaches. We stayed for a week with our 14 year old son; I’m half Greek, my husband is Danish, we are both world travelled, spent our summer holidays in Greece for the last 20 years so are somewhat fussy and used to those inconsistencies in quality which my husband affectionately refers to as the local ‘charm’. The owners paid a lot of attention to detail, both in the architecture, design and furnishings. This includes a fully functional kitchen, decent size fridge freezer, plenty of sockets in practical spots, good size bed(my husband is tall), good air conditioning that’s not noisy, good lighting both indoor and outdoor, bed side lamps (with separate bed side sockets so I could plug in my phone! ), good quality consistent fast WiFi, a Nespresso machine, kettle, lots of running hot water, pretty but solid practical furniture. Unlike other places I’ve encountered they used good quality materials and it’s all actually finished and to a high level of quality! Our apartment had privacy, morning and afternoon shade, trees, solid large umbrella, and there was a clean good sized deep pool with plenty of chairs and umbrellas (none of the flimsy kind). The grounds are also well kept, lots of flowers and green all well maintained. I know I mention quality a lot, but I’m used to door handles that come off, running out of hot water or not finding shade so Belogna Icons was a welcomed surprise. A lot of thought was put into this place setting a high standard I don’t expect to come across often. 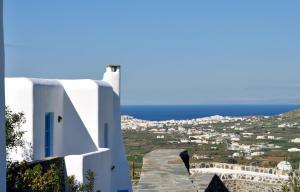 Naxos' roads are winding and steep but this destination is well worth the trip. Only a 10 minute drive inland from Chora (Naxos town) these villas offer privacy and a stunning view of hills, villages, and ruins, all the way to the sea. You can even see the gleaming white town of Chora and the Kastro from here. The amenities and space at our Villa were superior. Beds and furnishings are extremely comfortable and top notch. A full kitchen with a Nespresso coffee machine and other surprises made breakfast end evening snacks easy, but you can easily prepare larger meals. The entire place is well-designed for relaxation. If you prefer some quiet, this is the place. Any destination in Naxos is accessible from here with car. Service is very hospitable, we were greeted at the port by the owner who led us to the property. A generous welcome basket included bread, marmalade, honey produced on the owner's property, coffee, tea wine and raki! Combined with the fruit and pastry we bought for breakfast on the way in, this is all we needed for breakfast and nightcaps. Plenty of light and electrical outlets. Thick towels and soft linens.